The Aduro Radiance bed provides a new solution to anti-ageing for the entire face and body. The Aduro Radiance emits specially designed red light, which stimulates collagen production, activating the skins elasticity and creating a significant rejuvenating effect on the body. Aduro Radiance uses the latest technology from Cosmedico in Germany. Using the Aduro Radiance regularly helps give skin a firmer, tauter appearance with a more youthful radiance and reduced wrinkling of the skin – thanks to the increased collagen and the regeneration of elastic fibres. Aduro Radiance treatments can be boosted through the use of Aduro Glow cosmetics, with highly effective active ingredient of hyaluronic acid. Combating signs of ageing. Aduro Radiance is clinically proven to be an effective treatment for anti-ageing – giving skin a more youthful and more radiant glow. Aduro Radiance provides a solution for wonderful white and youthful complexion for the entire body. Use Aduro Radiance with Aduro White cosmetics for the best Aduro rejuvenation experience! Dual Canopy for a full facial and body Rejuvenation Aduro experience. The latest in anti-ageing light technology from Cosmedico Germany. 20-minutes for more radiant looking skin. Boosted treatments with the use of Aduro White cosmetics. Whiter more wonderful skin complexion. Fight the signs of time with Aduro Radiance anti-ageing. Safe, effective and without harmful UV rays..
A rejuvenating light experience like never before. How does the Aduro Radiance work? The Aduro Radiance uses the latest anti-ageing technology, through the use ofCosmedico anti-ageing light. The rejuvenating light penetrates deep within the skin, boosting collagen production and elastic fibre activity, which help remove fine lines and wrinkles. Aduro Radiance light is able to even out skin tones, breaking up melanin deposits within the surface of the skin – promoting a more even and clear complexion, for wonderful white skin. An Aduro Radiance treatment is completely safe, with no harmful UV rays. With most users describing the treatment incredibly relaxing – try an Aduro treatment today and be fully immersed in a full rejuvenating light experience, like never before. The Aduro Radiance is a safe and natural treatment, which has a vast range of benefits to the skin. Benefits include the improvement of skin tone, reduction in fine lines, wrinkles and age spots. The results are that aged skin is firmed, ejuvenated and more even - for younger looking, rejuvenated skin. The treatment is pain free and non-invasive, requires no surgery and is a safe and effective treatment for anti-ageing. The light does not emit any harmful UVA or UVB rays and is not a laser, which means that users after treatment require ero downtime, or recovery time and is safe for all skin tones. Light therapy is medically recognized and is clinically proven, with independent studies of over 40 years of scientific research and support. 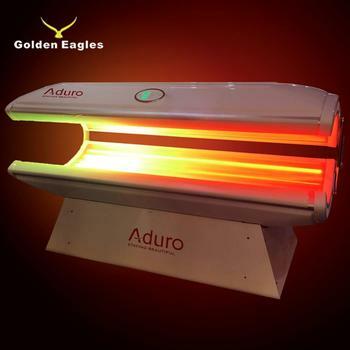 The Aduro Radiance is for skin rejuvenation; it is not for tanning and will not darken or tan the skin.